The Lord of the Rings, Peter Jackson's film trilogy adapting the classic fantasy novels by J.R.R. Tolkien, were a high watermark for fantasy cinema. The Fellowship of the Ring, The Two Towers, and The Return of the King's theatrical releases each came to about three hours, and the extended home video versions (which we're defaulting to for this list) are more like four hours apiece. In other words, there's a whole lot going on in these movies. They tell the story of Frodo Baggins, a hobbit from the Shire, and his quest to take the evil One Ring that was forged by the Dark Lord Sauron to the volcano where it was forged and can be destroyed. Along the way he finds many allies and enemies. There are huge epic battles, wizards, orcs, all that stuff. When you see the movies as a child, the magic and suspense sweeps you away into the fantasy, but when you rewatch as an adult, different things stand out. In some places, the movies show their cracks—and in others, they show surprising depth and complexity. Here are some of the things about the Lord of the Rings movies that it takes an adult viewer to notice. At first glance, the Shire seems idyllic. It's incredibly beautiful, peaceful, and lacking in the kind of monsters that seem to crowd the rest of Middle-earth. But what do you do if you're a hobbit living in the Shire? If you're rich like Bilbo and Frodo, you sit around reading or writing books. You go to parties, eat dinners, or go down to the Green Dragon Inn to hang out with your friends. If you're poor, you spend your days tending crops or raising farm animals. 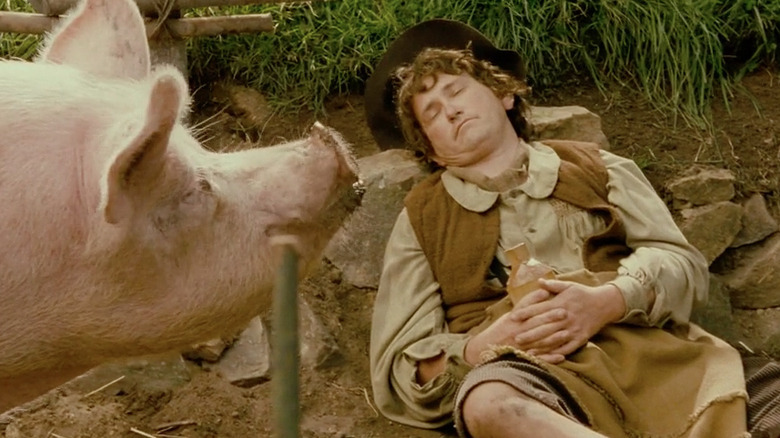 You milk cows that seem gigantic to a hobbit, and occasionally sneak a nap in the mud next to your pig. In short, the Shire seems about as boring as it possibly could be. 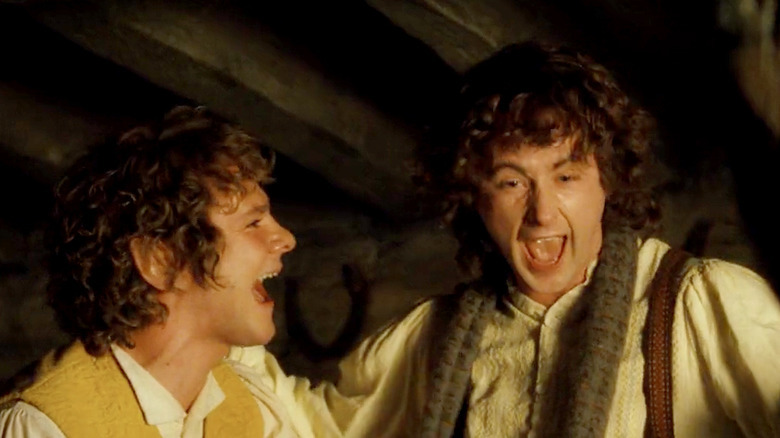 And worse, if you're a hobbit with a reputation for having fun and seeking out adventures, like the Bagginses, your social standing will suffer. Hobbits are nosy neighbors, and they look down judgmentally on anyone who's less than content with a life of doing basically nothing. As beautiful as it might be, the Shire is a place where there's not much to do—and if you look for more, everyone will think you're terrible. Not exactly paradise. So what do Hobbits do to compensate for the boredom of living in the Shire? Well, they like to eat. But they really, really like to drink. 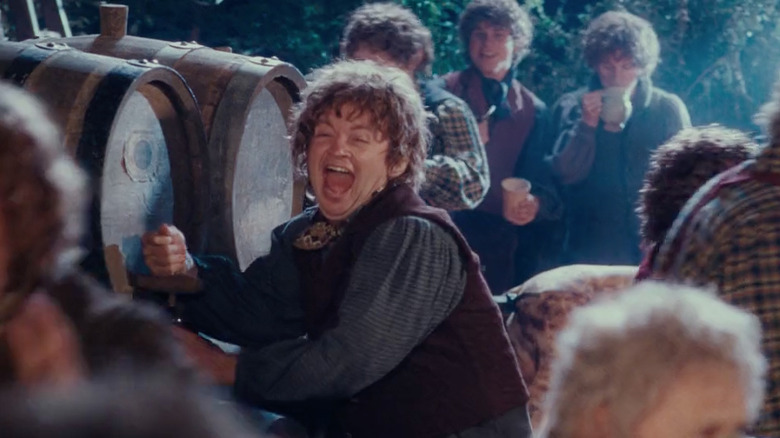 And as we see at Bilbo's birthday party and in the Green Dragon, moderation isn't necessarily a part of their drinking culture—hobbits seem to get drunk a lot. Anytime they gather, many cups of ale will be poured and consumed. There will be excessive laughter, off-key singing, and dancing. Since this is a fantasy world, it's nice to assume that hobbits are immune to hangovers, as well as the life-ruining effects of alcoholism. But even if that's the case, the constant drunkenness kind of takes the shine off the purity and virtuousness of hobbits. Here's the thing about Merry and Pippin, which is more clear in the novels but still obvious in the movies if you pay attention: they're rich. Richer than Frodo, who's already rich enough not to work, and much much wealthier than working class Sam. Merry is Meriadoc Brandybuck, the son of the Master of Buckland, and Pippin is Peregrin Took, the son of the Thain of the Shire. In other words, Merry and Pippin are literal Shire nobility, and in line to inherit their fathers' titles. The two of them wear the nicest, most ornately designed clothing of any hobbits in the movies. So when Frodo and Sam run into them on the way out of the Shire in Fellowship of the Ring, why are they stealing food from Farmer Maggot's crops? It's not because they're hungry—they could afford to buy whatever they might want, and both of their homes are probably stocked with delicious foods and cooks to prepare them. No, they're stealing from poor Farmer Maggot for the same reason they stole and set off that dragon firework at Bilbo's party—for the thrill. And while it's easy to dislike Maggot for his gross name and the the fact that he pointed that Ringwraith toward Frodo, he's just an honest working hobbit who needs his crops to make money and feed his family. Once their quest gets going, Merry and Pippin are the ones who complain about not stopping for Second Breakfast, and who attract the Ringwraiths to Weathertop by starting a fire to cook bacon and sausage. They come off as callow, pampered rich kids who've never needed to take anything seriously in their lives. Fortunately they learn and mature over the course of the series, but in the beginning, they're the worst. Tolkien surely meant for pipe-weed to represent tobacco. And when you see a barrel of it in Saruman's stores in The Two Towers, it looks like tobacco. But when characters are smoking it in the movies, it seems more like…something else. This is first evident in Fellowship of the Ring, when Bilbo and Gandalf sit on a hill before the party and smoke. They're just two friends chilling out, taking long drags, and then making fancy shapes out of the smoke. Later in the movie, Saruman judges Gandalf for all that smoking, saying, "Your love of the halflings' leaf has clearly slowed your mind." Nobody has ever accused anyone of smoking so much tobacco that they've become stupid, but that accusation is leveled at marijuana smokers every day. 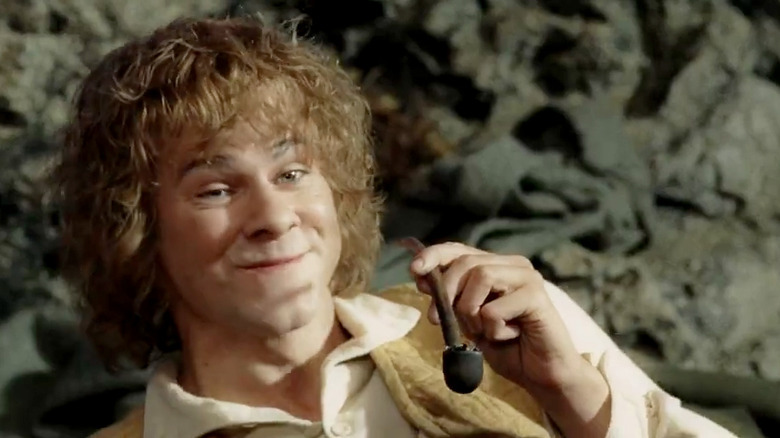 But the true nature of pipe-weed is never clearer than in the scene at the beginning of Return of the King, when Merry and Pippin are relaxing on the outskirts of a flooded Isengard. They've smoked so much that they're squinty-eyed and giggling, and stuffing their faces with food. They're also drinking a bit, but they're not particularly acting drunk. They're acting very stoned, which means that at least the actors who play them have a pretty clear idea about the effects of pipe-weed. There's only one truly dangerous drug in Middle-earth, however, and that's the One Ring. The Nine Rings given to men were similarly dangerous, but they long ago claimed their only victims. The One Ring, on the other hand, tempts every character it's near, and those who hold it can't get enough of it. Gollum is the worst junkie of all, of course. The ring takes over his life, just like addictive drugs do in the real world, until he can think of nothing else. It has horrible physical effects as well: his body becomes grossly emaciated and he loses most of his hair and teeth. Anyone who's ever met someone addicted to heroin or crystal meth will find Gollum's appearance and behavior disturbingly familiar. Gollum kept the ring for hundreds of years, but Bilbo, who only held it for a few decades, suffers effects as well. With Gandalf's help, he's able to beat his addiction—to give up the ring—but he never stops thinking about it. The next time he sees it, he nearly attacks Frodo to get at it. Even in his advanced old age, after the ring has been destroyed, he still asks to see it one more time. 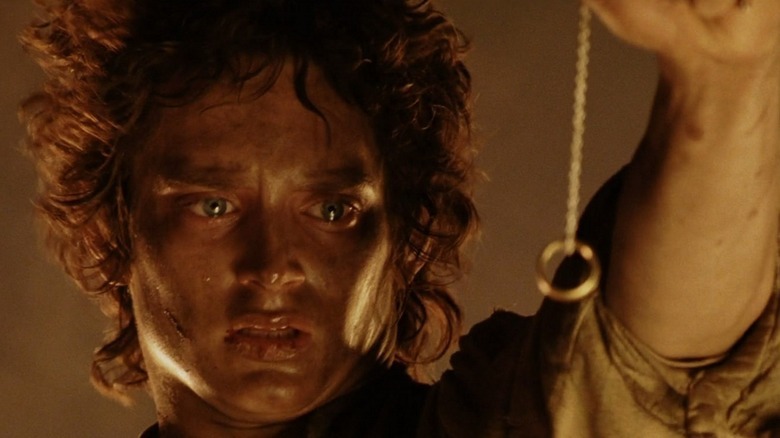 Frodo only had the ring for a much shorter time, but even he ultimately can't let it go, and it ultimately costs him the finger he wore it on. 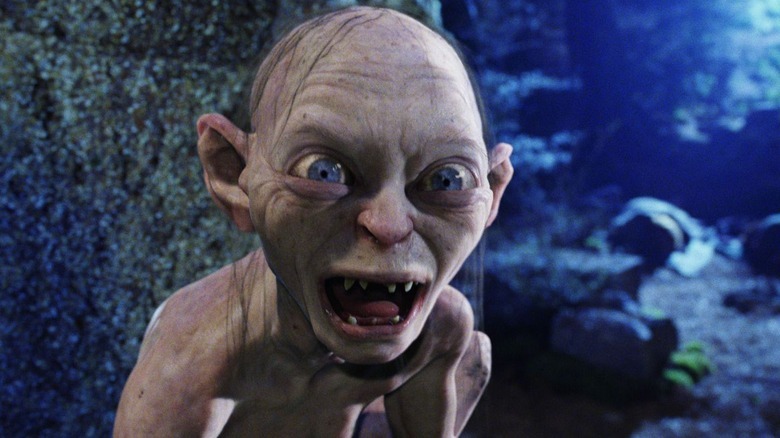 When The Two Towers was released in 2002, everyone was amazed by the motion-captured spectacle of Gollum, and the performance of Andy Serkis as the character. And we weren't wrong—it was an achievement unlike any before in film, and the visuals still look great. 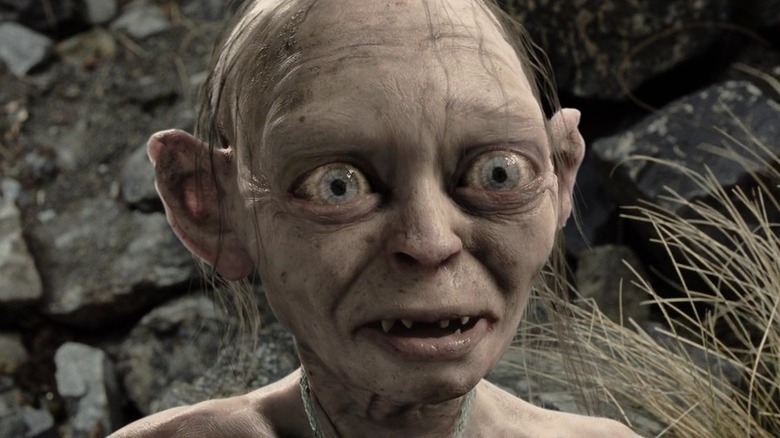 But rewatching as an adult who has seen many other movies with mo-cap characters, something else is inescapable about Gollum: he's one of the most annoying movie characters of all time. All he does is whine and shriek and yell and flail around. He's a constant hindrance to Frodo and Sam throughout the last two movies, while being too sad and pitiable to be a fun character to watch. He's not even evil—he's just a gross, pathetic junkie who never shuts up. He's essential to the plot, especially at the end of the trilogy, and he's portrayed very accurately to the books. It's just really exhausting having to put up with him for so long. "Frodo's been stabbed by the Witch King with a blade poisoned with evil! Is he dead?" No, medical care from the elves of Rivendell will heal him. 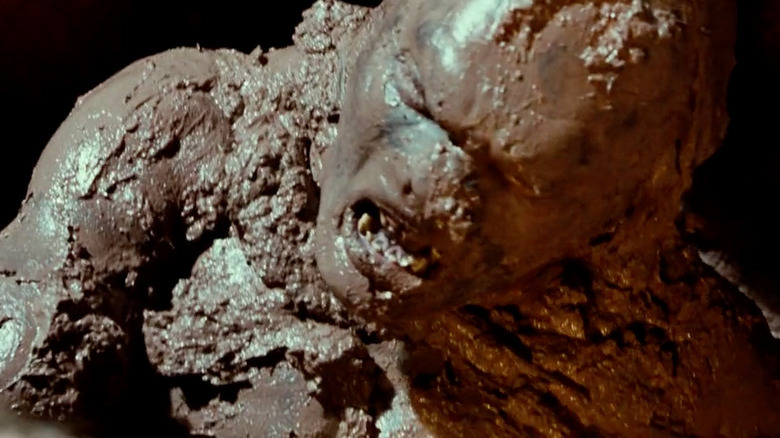 "Frodo's been speared by a cave troll! Is he dead?" No, he's wearing an undershirt of magical elvish armor. "Frodo's been stung by a giant spider and taken away by orcs! Is he dead?" No, the spider just temporarily paralyzed him and Sam saves him from the incompetent orcs. "Gollum knocked Frodo into a volcano! Is he dead?" No! He's just hanging on the edge, waiting for Sam to pull him up. 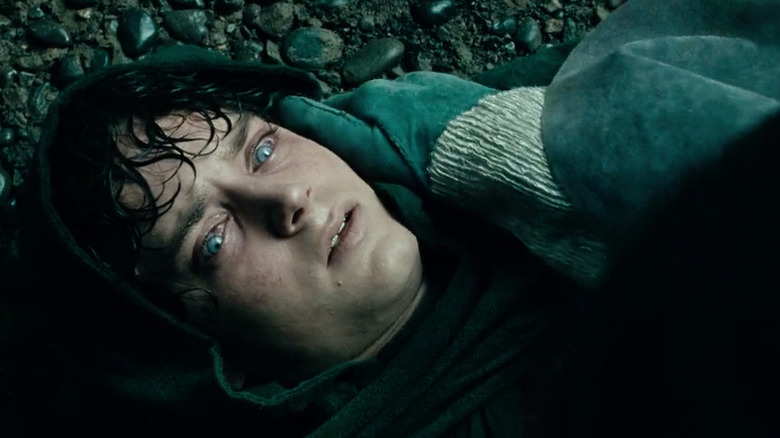 Kids watching Lord of the Rings might be a little freaked out by these fakeouts, but as an adult you just want to yell at the screen, "Stop trying to make us think Frodo is dead! He's the hero, and this isn't Game of Thrones! He's not going to die!" Every action epic has one or two moments where they make you think the hero might be dead, but these movies just keep returning to that well, long after it's dry of any suspense. Uruk-hai are the huge muscular orcs that make up most of Saruman's army in the movies. Unlike regular orcs, who are a bit smaller than humans and tend to slouch and skitter around, Uruk-hai stand at least six feet tall and walk like men. They have reddish brown skin, in contrast to the grays and greens of the smaller orcs. But what exactly are Uruk-hai, and how does the Wizard Saruman create them? Gandalf tells Elrond that Saruman "has been breeding orcs with goblin men." But that doesn't make much sense, because orcs and goblins are the same thing, and this is literally the only mention of "goblin men." Are they a crossbreed of goblins and men, and wouldn't that just mean that Uruk-hai are three-quarters orc? It's never explained. But when we actually see an Uruk-hai being born, it makes even less sense. A bunch of regular orcs dig a shapeless mass out of the mud under Isengard, which then turns out to be a fully-grown Uruk-hai inside a translucent membrane, which he immediately breaks through and starts killing. Are we to believe that Saruman is farming Uruk-hai? What did he plant in the ground to make one grow? A regular orc with a spell cast on it? A goblin man, whatever that is? It's never explained at all, and you just have to accept the Uruk-hai and move on. Most of the drama in Lord of the Rings is magical and world-spanning in nature: all about the Dark Lord who wants to rule Middle-earth and the various creatures and devices that help him work toward that goal. But watching as an adult, what's going on with the first family of Gondor can be almost too relatable. When we meet Boromir in Fellowship of the Ring, he's basically a good man but a little too desperate to be seen as a hero to his homeland. After he dies, we meet his young brother Faramir in The Two Towers, who's more thoughtful and sensitive but has a similar drive to prove himself to Gondor. 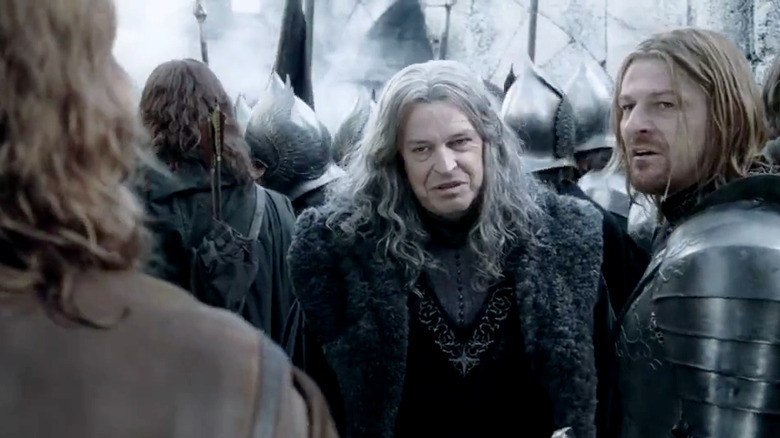 Finally, in Return of the King we get to know their father Denethor, and everything suddenly makes sense. The Steward of Gondor, Denethor is overbearing, judgmental, and more than a little unhinged. He praises Boromir for being a great warrior, while still holding him to exacting standards. He disparages Faramir for being scholarly and interested in dreams, even though Faramir in his own way can be just as effective in war as his brother. It's no wonder both brothers are so driven by insecurities and a need to show their worth. That's what having a toxic and demanding parent does to you. This bit of realistic family turmoil in the midst of a fantasy world is actually very effective in grounding the story, and Denethor's ineffectiveness as a ruler underlines the need for the exiled Aragorn to return and become King of Gondor. In the Lord of the Rings novels, the Eye of Sauron is a symbol of the Dark Lord, who actually has no corporeal form. The eye is glimpsed in visions, but it's not an actual, physical thing. In the movies, Peter Jackson changed that—Sauron appears as an actual eye made of flame, suspended on top of the dark tower of Barad-dûr in Sauron's kingdom of Mordor. The Eye is seen constantly watching everything, casting light where its gaze falls like some kind of evil sentient lighthouse. It's creepy to look at, probably even scary for a child, but for adult viewers it just raises questions. 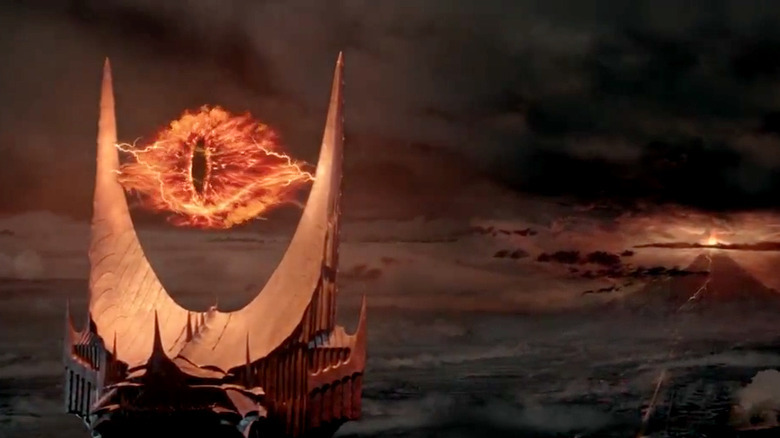 Is that Eye all there is to Sauron, or does he have more of a form inside the tower, and the Eye is just a projection? Is the tower itself his body? Sauron seems to be aware of things happening all over Middle-arth, so why does the Eye seem to be trapped between those two spikes on Barad-dûr? And most of all, why should we be so afraid of a villain who does nothing but look? This portrayal of Sauron is symbolic of a lot of things going on in Jackson's Lord of the Rings movies. In adapting such a long and complex story for the screen, many things have to be simplified and made more visual. Inevitably that leads to some aspects that don't make much sense, and some things that just look silly. So while these movies still have plenty for adults to enjoy, the best way to approach them is with one's childlike sense of wonder firmly intact.